"I want to work in Tech because I want to make a lot of money." "I want to work in Tech because I want to get free food everyday." "Every office is beautiful like Google." When people think of working in Tech, they often have a lot of misconceptions of what life is actually like. 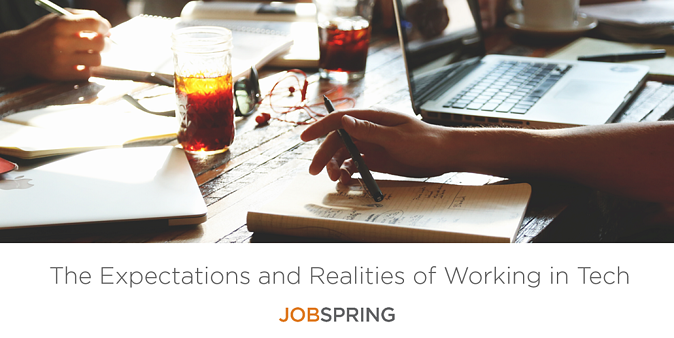 Scott Purcell, Division Manager of Jobspring San Jose, sheds some light on some common expectations people have. Reality: Each company is different. Some startups work long hours often and some have a relatively normal work-life balance. Some big companies have very long hours while others are very flexible. 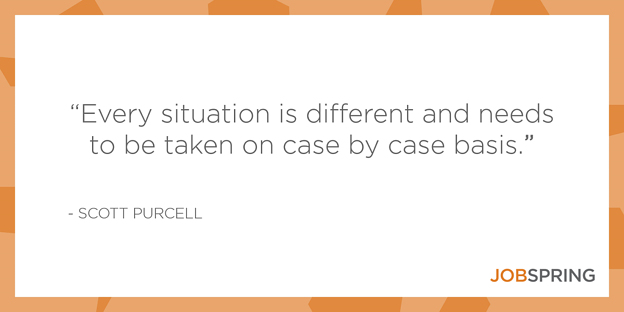 Every situation is different and needs to be taken on a case by case basis. The normal "9 to 5" work hour doesn't really exist, but some companies have longer hours during releases or allow telecommute and/or flex hours. Lucky for the tech industry, there is a choice between working full-time and contract positions. If you choose the contract road, there are some benefits such as getting paid for every hour you work as a contractor and receiving overtime when you're asked to stay on for those late nights. This isn't to discount full-time, though, because long hours usually mean raises, bonuses and a higher worth on your stock options. Think your comapny has a great workplace for technology professionals? Nominate it to be Sillicon Valley's Best Tech Work Culture here. Reality: Every company's environment is different. Specifically in Silicon Valley, most companies have moved away from the cubicle environment and work more in an open, collaborative atmosphere. A lot of companies really believe in an open space environment. According to Inc., an open environment allows you to immerse yourself into an office culture and improves communication. Also, non-tech companies need talent too, as this SkilledUp article says. The benefits could be less catchy but more tangible. For instance, if you're interested in helping others and developing better patient care, you might want to work for the healthcare industry, which in turn as a non-tech company could be less stringent about your skill sets as job requirements, and more open to skill set plus industry experience. So not only will you not get moved to the basement, there are some definite benefits to working for a tech department over a tech company. Want to jump start your tech career? Check out all our job postings. Reality: A lot of companies do offer "extras" like lunch, travel and other perks, but that is not always the case. Many companies do this as a way to attract talent or if they aren't close to dining options. 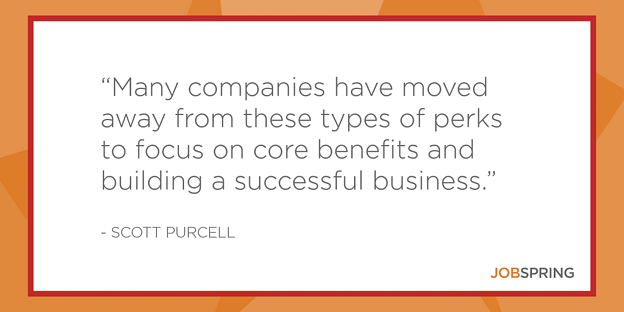 A lot of factors go into what a company offers and many companies have moved away from these types of perks to focus on core benefits and building a successful business. Benefits of workplaces like the ones on the Glassdoor List of Top 20 Best Company Benefits & Perks - which include every other Friday off, ski passes and sabbaticals - have slanted job hunter's perception of what really matters. However, this Glassdoor study shows that among the factors that contribute to happiness at your job, benefits and perks rank fifth after culture, career opportunities, senior leadership and work-life balance. Reality: One of the most common misconceptions, specifically in Silicon Valley but in this job market in general, is that they will automatically get a big raise at their next job. This is typically based on hearing how good the market is and the general cost of living in tech hubs like Silicon Valley. The reality? Companies have set ranges for their positions and value employees based on what they can bring to the table and how they fit into their current pay structure. If you're already at the top of the range, which isn't uncommon, there may not be much wiggle room on salary - despite hearing about what others are getting in the market. © 2012-2017 Motion Recruitment Partners LLC. All rights reserved.